The EWG cleaning database rates 16 of their products at an A (10/14) or B (4/14): (http://www.ewg.org/guides/search?utf8=%E2%9C%93&q=GreenShield&page=1&per_page=15&x=0&y=0) which is what originally brought this company to my attention (searching the products that scored an A with EWG). I’ve had them on my ‘Approved’ list for quite some time, but have never seen their products on the shelves of the stores I shop in, or heard from many of you on this page who’ve tried them so I was very happy when they agreed to send me a few products to sample to get a feel for the line. All-purpose cleaner- 32 oz $4.99. Ingredients: Organic Citric Acid, L-Malic Acid, Organic Soybean Oil, Organic Lemon Extract, Organic Acetic Acid, Organic Soap Bark, Organic Glycerin, Water. My experience with this product is exactly as described in their FAQ: their products are meant for everyday use. If you have lots & lots of caked on grease & grime you are not going to get the results you would with a harsh, traditional cleaner. I first used it on my stovetop which I’m not good about cleaning on a regular basis, so it was very dirty & greasy. I let it soak for 20 minutes or so, and can say it did an OK job. Mainly I needed a lot of “elbow grease” and several rounds of spraying to get it decently clean. But, I don’t blame the cleaner for not doing a good job, I blame my lack of staying on top of it, and now that I’ve got it relatively clean I’ve been spraying it down more regularly & feel it does a decent job. It says on the label (most of the labels) that it fights odor causing bacteria, but not food borne bacteria so you should “clean contact area after each use”. So I follow-up with my normal go-to all-purpose cleaner which is vinegar soaked in orange peels for a final wipe down (here’s my “recipe”: https://www.facebook.com/photo.php?fbid=494009793947999&set=a.494009763948002.128085.397517646930548&type=3&theater). Toilet bowl cleaner- 24 oz. $4.99 Ingredients: Distilled water, organic citric acid, organic acetic acid, lactic acid, organic guar gum, organic acacia gum, xanthan gum, organic glycerin, organic fragrance. As with the All-Purpose cleaner, you can’t expect it to work as well as something harsh like The Works, but it does work. It is septic system safe. It didn’t remove my hard water stains from the toilet, but they’ve been there a long time since I haven’t used a store-bought toilet bowl cleaner in years as I normally use my orange peel infused vinegar to do all my cleaning. 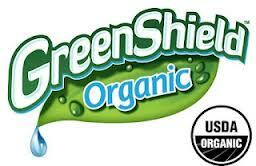 I feel both the All-purpose and Toilet Bowl Cleaner by Green Shield worked as effectively as the vinegar. So why not just use vinegar then? Many have expressed their dislike of vinegar, even after soaking it in orange peels, so this would be a great alternative for that crowd. I feel these products are very reasonably priced, shipping it reasonable as long as you’re not ordering 1 item (which I never recommend), and I absolutely LOVE that this company has taken the steps to be USDA certified organic. Other products include: automatic dish detergent, bathroom cleaner, glass cleaner, kitchen cleaner, carpet spot cleaner, surface wipes. They also have a ‘Commercial Products’ category, where they offer all of their products in a 5 gallon cardboard box for a reasonable price. They told me they’re working on a regular dish soap for hand washing as well! Glad to read this, I saw a giant container of the free&clear detergent at Costco and grabbed it. Came home and started researching it since I’ve never used any of their products, glad to see your stamp of approval. It may be eco friendly but it will not get your clothes clean. We even tripled the dosage and still did not have any luck. It has definitely received mixed reviews! I suspect company employees are leaving good reviews. I only say that because this stuff is that bad. I emailed the company with my complaints and got no reply. I left product reviews on their website and they were removed. I can only add BUYER BEWARE. No, several people on my page have shared good reviews & continue to. It depends on many factors such as hard or soft water, and expectations more than anything. But I have heard from people who’ve been on my page quite sometime & I know they have no company affiliation who truly do like the products. I’ve found that with just about every product I’ve ever reviewed, not 100% of the people who try it will like it….